Espressivo of our time. His [Adès's] violin concerto, "Concentric Paths" of 2005, opens dark sound worlds of expressive Melos. 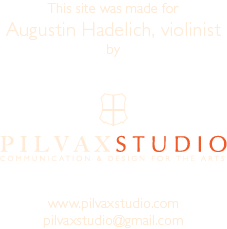 The young violinist Augustin Hadelich takes full advantage of this, his rounded silver tone hugging the orchestral contours like a snake chain necklace.